Albert van der Sel : Quick introduction SSIS. For who	: For anyone who likes to start using SSIS and BIDS. 2. Using the Import Wizard. 3. Introduction SQL Server Business Intelligence Development Studio (BIDS). 4. Ways of executing/scheduling packages. 5. A few notes on Migrating and/or running SQL 2000 DTS packages from SSIS 2008/2012. essentially the import or export of "data" to and from SQL Server databases. In most cases, SSIS will be used for all sorts of imports, like for example to a Datawarehouse database. and whenever you need to define multiple tasks and descision logic, which you can all build into one SSIS "package". 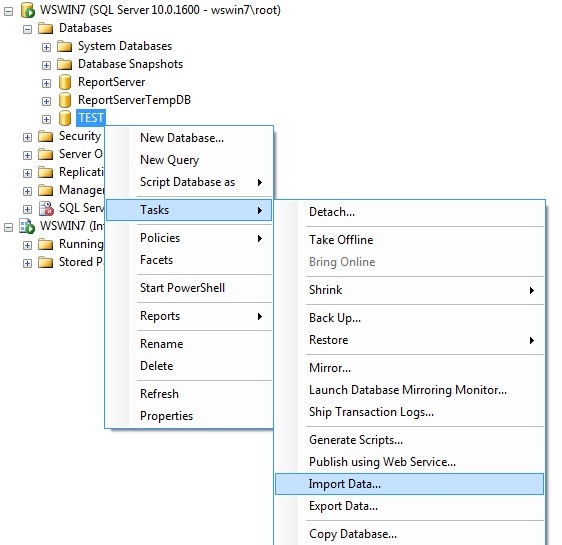 Ofcourse, SSIS can also be used to transfer tables from one SQL Server database to another SQL Server database. 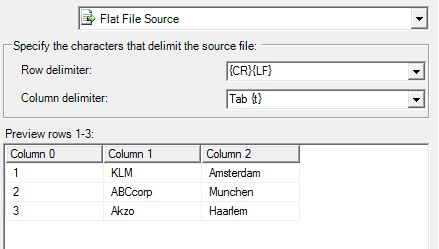 Sometimes, there are alternatives for SSIS, especially when dealing with flat (ascii) files. For example the "BULK INSERT"
SQL Statement, and the "bcp" command promt utility, are excellent tools for just importing ascii data into SQL Server tables. determines which next steps are neccessary to execute. And moreover, sometimes you need to "transform" data, in order to make it useable for loading in SQL Server tables. 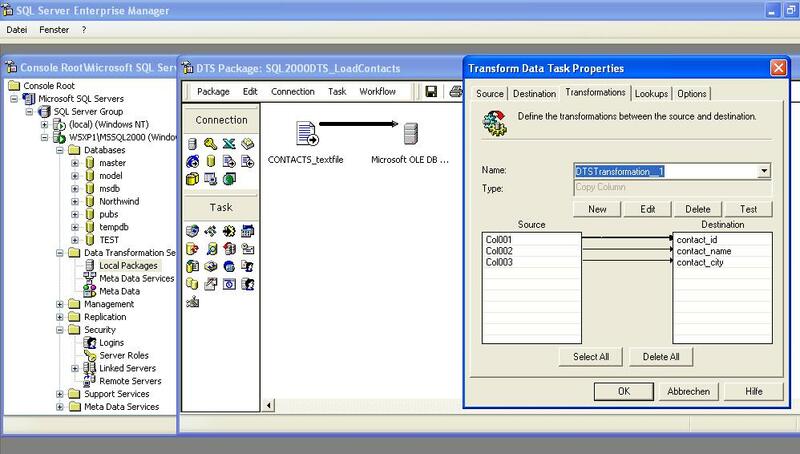 So, here SSIS can really help in every aspect of Extracting Transforming and Loading (ETL). 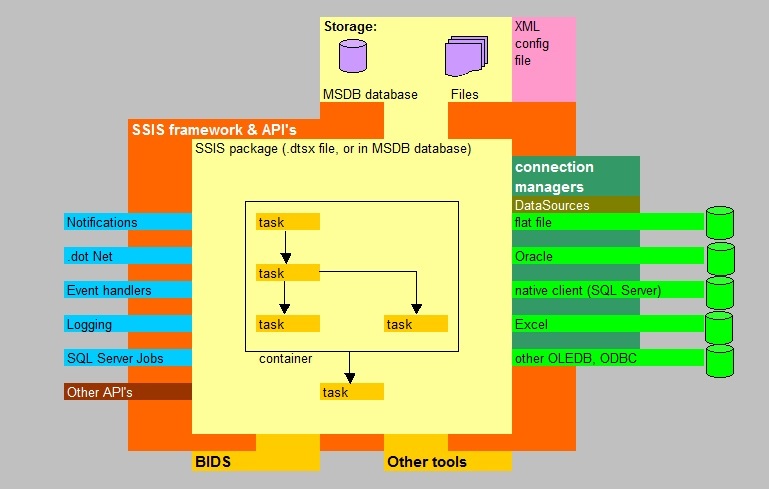 A very high level overview on SSIS might be provided by figure 1, which shows the most prominent components. As you can see, there are quite a few components involved. 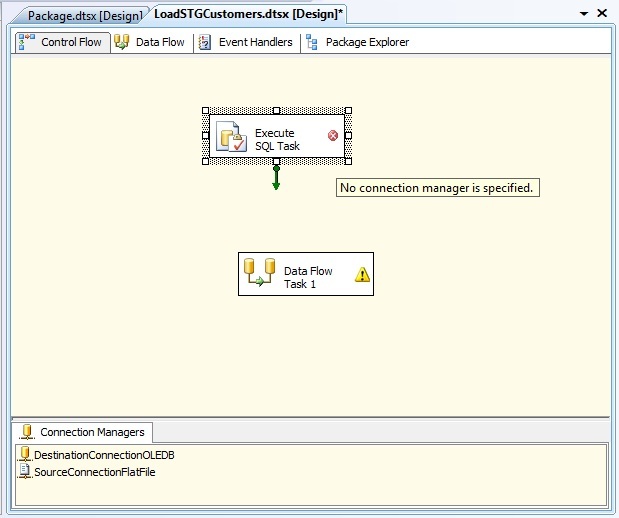 First, SSIS allows you to use a number of "connection managers"
in order to be able to access "external" data like text files, XML files, Oracle Tables, Excel sheets etc..
And, as you compose the package, you typically will add a certain number of tasks, with possible workflow between them. and, most importantly, through "SSIS Designer", which is most often referred as "Business Intelligence Development Studio" (BIDS). SSIS packages, and other programmatic "solutions". or in the MSDB database. just be descriptions in XML, or some other format, which will be "interpreted" by the SSIS runtime environment. Let's start with the easiest way to make a package: using the import Wizard (which will be described in a very compact way). and how we can can import it in BIDS. As of section 3, we will really start using BIDS. 2. Using the import/export Wizard. It's easy to perform an import or export to/from (one or more) SQL Server tables, using the "import/export Wizard". never used the Wizard before. - I suggest that you create a folder called "C:\ssistests" (or another foldername of your choice). - Also, I suppose you have some test/play SQL Server system (2005/2008/2012) with some test database. Note: it might be that this section is.. well.... "boring", if you have used the Import Wizard before. Anyway, the sole goal here is to get an .dtsx package "fast, and the easy way", using the Wizard. If this is all old news, then goto section three. Let's load the (empty) "STG_CUSTOMERS" table, with the data from the "c:\ssistest\customers.txt" file. This should be really easy, when using the Import Wizard. To start, rightclick your TEST database, select "Tasks"
and choose "Import Data". This action will call the Import Wizard. If you see the "Welcome screen", the click "Next". We are not showing all Dialogboxes here. Anyway, in the dialogbox that follows you must choose a "Datasource". choosen datasource. Next, "browse" to the "c:\ssistest\customers.txt". Take a good look at all propeties which will appear, like "Format" and "Header rows to skip: 0" etc..
to goto the next row in the file. And, in our case, the fields are seperated (delimited) by the "Tab" symbol. which usually is named "SQL Server native client". Check the list for all possible "destinations". the Wizard (probably) has choosen the "customers" table to be the destination table. Fig 4. Source and Destination as presented by the Wizard. After you have changed the destination to be the STG_CUSTOMERS table, click Next. that is, in the MSDB database, or as a file on the filesystem. Ok, now select that you want to save to the filesystem (in c:\ssistests). Fig 6. Saving the package to the filesystem. Allright, now save the package as shown in the next dialogbox: as "c:\ssistests\LoadSTGCustomers". 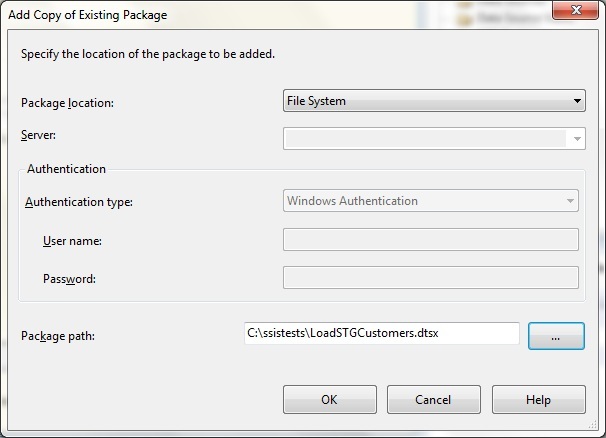 Next, the SSIS package LoadSTGCustomers.dtsx will be saved to "c:\ssistests", and executed. Hopefully, all went well and 3 rows are imported to the STG_CUSTOMERS table. you should see some pointers in the output as to what caused it. load it twice with the same data. An easy way to delete all rows from the table is using the SQL statement "TRUNCATE TABLE STG_CUSTOMERS"
working your way through the former doalogboxes. I only want you to note that the contents of the .dtsx package, is just XML (to be interpreted by the SQL Server/SSIS runtime). in system tables in the MSDB database. Fig 7. Specifying "SQL Server" (msdb) where the package will be stored. Note that you can query system tables in the MSDB database, just like any user table. The figure below, shows some content from the "sysssispackages" systemtable. Fig 8. Query on the "sysssispackages" systemtable in the MSDB database. From your SQL Server program group, startup "Business Intelligence Development Studio". Before we start creating packages, we need to get familiar with a few terms. ⇒ A "Project" might function like a container, which may hold one or more SSIS packages (or other items, like SSRS reports). If you would only create one package, then your project effectively is that one sole package. So you could easily say: Let's create a Project, to start our ... ! ⇒ However, in "Visual Studio like" tools, people often create "solutions", which can be a C# program, a SSIS package etc..
A "solution" might function as a container too. But a solution generally is a wider concept. It can hold just one Project (e.g. just one package), or even multiple projects. In section 2, we created the "LoadSTGCustomers.dtsx" package, using the Import/Export Wizard. Let's create a new Project in BIDS, and see how we can "load" or "add" this existing package. Click "File" -> "New" ->"Project" as shown in figure 9. In the Dialogbox which appears, has a left pane, and a right pane. In the left pane you can choose for "Business Intelligence Project". If that one is selected, then in the right pane, you can choose from serveral templates, like "Report Server Project" and others. Ofcourse, we will choose for "Integration Service Project". As shown in figure 10, choose the name and location as suggested. Fig 10. Choosing Integration Service Project, and specify the name and location. In essence, BIDS rightfully "thinks" that you will start working on a new package. Take good notice of the screen. On the left there is something you can call a sort of toolbox, with incredably many items. where Datasources (how to access data) and Packages (the "mechanics") are shown in a "folder-like" structure. Note how the "empty" package simply is called "package.dtsx". Now, let's add our existing "c:\ssistests\LoadSTGCustomers.dtsx" package to our Project. In the Solution Explorer, rightclick the Project (LoadingStagingCustomersTable), choose "Add", and choose "Existing Package". Fig 11. Adding an existing package (from filesystem, or SQL Server). on the filesystem ("c:\ssistests\LoadSTGCustomers.dtsx"), we choose that, and then we browse to that path. or let it just hang there for now. Ok, now let's see how we can improve our "LoadSTGCustomers.dtsx" package, using BIDS. If you doubleclick the "LoadSTGCustomers.dtsx", you will see that the "Designer" area will show the items belonging to this package. Now, please pay attention to this. First take a good look at the middle of the BIDS screen: the Designer area. This area has multiple tabs (4 tabs), of which the "Control Flow" and "Data Flow" are the most important ones. You know that our package just only loads the STG_CUSTOMERS table from the "customers.txt" ascii file. So, we have just one task!. This is what you can see in the "Control Flow" area. 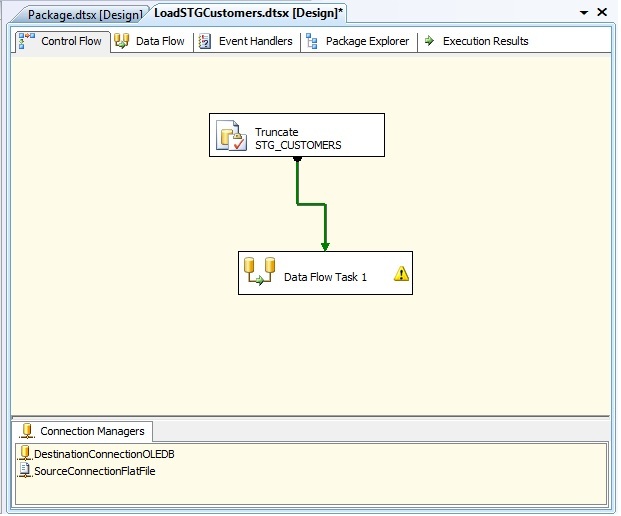 But, associated with that task, is a "Data Flow" item (from customers.txt to STG_CUSTOMERS), shown in the "Data Flow" tab. then there was no associated "Data Flow item" in the "Data Flow" tab. responsible for Data Flows..... Then.. you got it !! Above is indeed the essence. first "truncates" the "STG_CUSTOMERS" table. When that task is finished, we let our other task run (which has a Data Flow). You know that our STG_CUSTOMERS table has a primary key, so we can't load duplicate rows. that it gets cleared (truncated) each time before a new load happens. It's a sort of common practice. So, let's add another task that truncates out table first. We know that a SQL statement can truncate the table. will show you all possible "Control Flow Items (tasks)". one connection manager was named by the Import Wizard as "SourceConnectionFlatFile", which is not a bad naming at all. The other connection, to the SQL Server TEST database, was named by the Import Wizard as "DestinationConnectionOLEDB". Telling the new task "Execute SQL Task", what is must do, and where (on which connection), is not difficult. 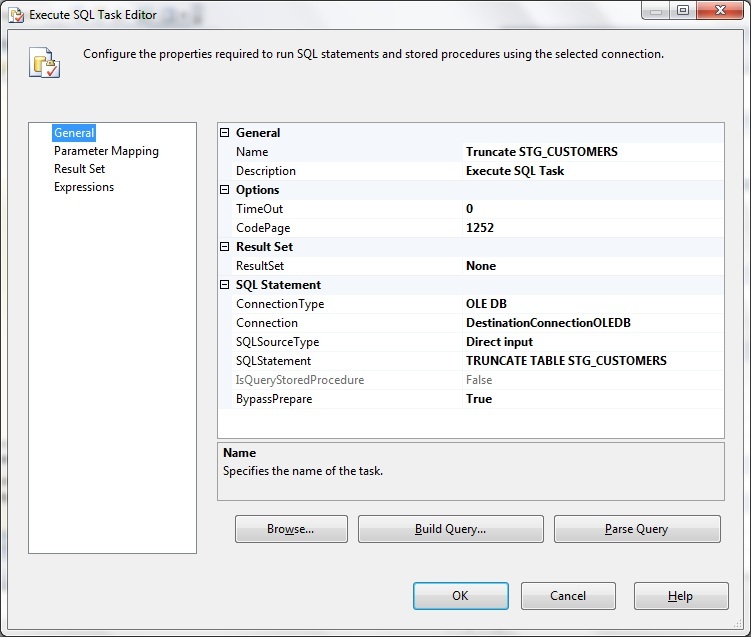 Just rightclick "the border" of the "Execute SQL Task" and choose "Properties". Or just doublick those "borders". In figure 17, I just doubleclicked the border of the task, which I find easier to view the properties in a better format. the SQL Statement, and to rename the task to a more fitting name (Truncate STG_CUSTOMERS). can set many more properties. But for our purpose, were done for now. the task we already had (I forgot to rename that one to a more appropriate name). The result should resemble to what you see in figure 18.
and if all went OK, the Task will be coloured green. This way, you can test all your (sub) Tasks. choosing "Debug" -> "End Debugging" from the Main Menu of BIDS. This way, you will go back to the normal edit mode again. So, here we really have a working project. Take a look again at the "Control Flow Items" on the far left of BIDS. As an example, you probably can imagine that we could start our Project with "FTP-ing" the "customers.txt" file from some FTP site. True, it is a bit hypothetical, since I would not recommend any FTP action from a Package, but that is not the point. The point is, that we are able to add another task, like a FTP task, as the first step/task in our Project. For that matter: you can place any appropriate Task to the Designer area, as the first-, the last-, or intermediate Task. how you can set the "authentication", how to rename the task to a meaningfull way, and set the path, and get- or put method. Tremendously much more can be said ofcourse, in developing SSIS packages. A large Project will undoubtly use many different tasks. In reality, you might encounter many small and/or large projects. But, "by doing it" is truly the best way to grow into SSIS/BIDS. in exploring this massive environment. 4. Methods of executing and scheduling SSIS Packages. but like everything else in this simple note, it does not claim to be "complete". a variety of errors may occur. However, many errors have "to do" with security issues or lack of permissions. For example, when you manually run a package, it might run correctly, but if you have scheduled it, it might fail. In many cases, it's a security issue. Always be aware that the account which is used to run the package from a schedule, might be the cause of the issue. In case of problems, always also check the Windows eventlogs (eventvwr) and the SQL Server errorlog. They often provide good pointers as to why a package (or task within a package) have failed. 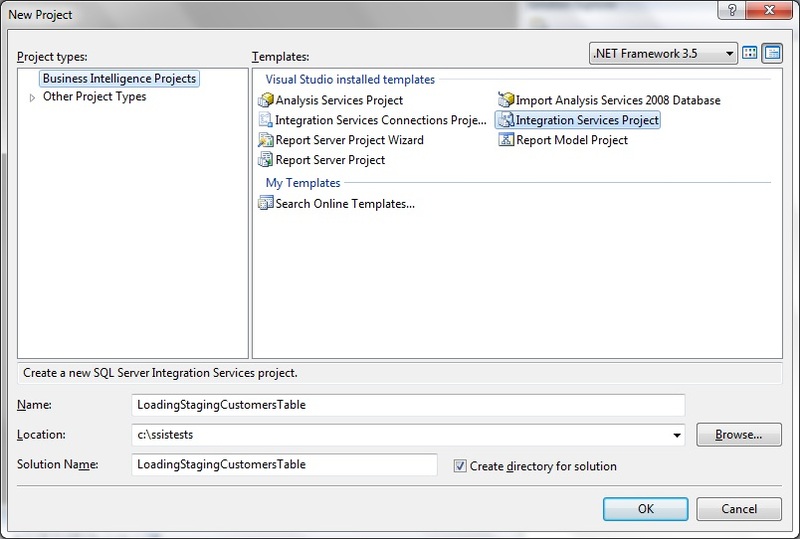 This is a graphical interface that enables you to execute (but not schedule) any SSIS package. 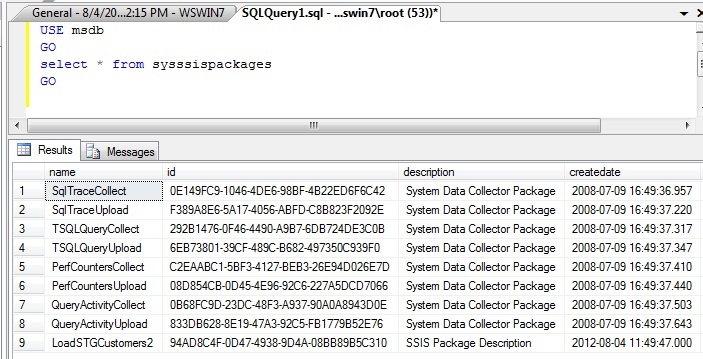 Here the package maybe stored on the filesystem, or in SQL Server. or a package in SQL Server (or a package in the socalled "package store"). In figure 20 shown above, I choose our familiar package "c:\ssistests\LoadSTGCustomers.dtsx" (from the filesystem). change back to "command line", you would probably see that some switches were added to the command line. 4.2 The "dtexec.exe" commandline utility. Actually, the graphical "dtexecui.exe" utility (see 4.1), is a Userinterface to the plane "dtexec.exe" commandline utility. You can use "dtexec.exe" to start a package from the "C:\>" commandline. batch file, and schedule this batchfile using (for example) the Windows scheduler. Use "dtexec /?" to view all commandline options. 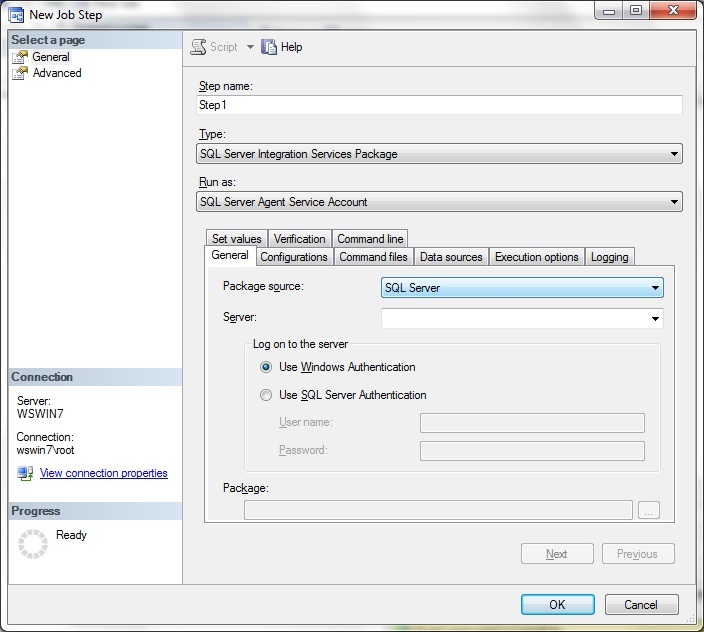 4.3 SQL Server Agent job. 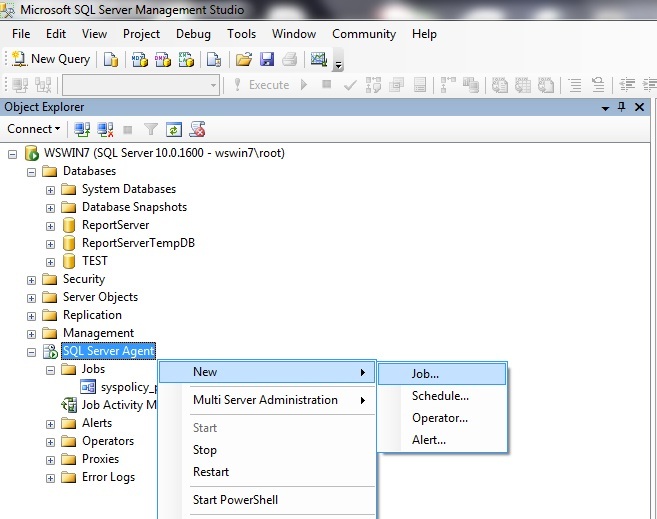 An easy way to add a scheduled SQL Server Agent job, is using the "SQL Server Management Studio" (SSMS). For this to work, the "SQL Server Agent" must be running, which is easy to check from SSMS. Rightclick the SQL Server Agent, choose "New", then choose "New Job". From the Dialogboxes that follows, you can add one or more Job "steps", and a "schedule" for this new Job. or CmdExec (Operating System command), Powershell script, and some other types, and a "SQL Server Integration Services Package" too. When choosing the latter, you can select the package source (like filesystem, SQL Server). 5. 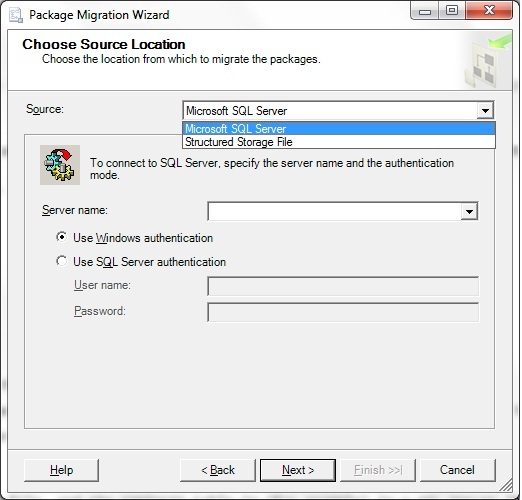 A few words on Migrating and/or running SQL 2000 DTS packages from SSIS 2005/2008/2012. them to SQL Server 2005/2008/2012. Although SSIS 2005/2008/2012, have quite a few differences among them, the overall architecture still is very similar. However, comparing SSIS (as of 2005) and DTS of SQL Server 2000, you can only say that the differences are enormous. SSIS is a completely new product and not a version upgrade from DTS (Data Transformation Services). DTS of SQL 2000 (and SQL7) uses a complete different architecture. if you compare that to DTS. ⇒ As another example, you know from Section 2, that SSIS packages are XML files to be interpreted by SQLServer/SSIS runtime engine. You could even "type" a (filesystem based) package file from the prompt, to view the contents. DTS packages are not XML, and their internal storage is completely different. where DTS packages are still in use. You might immediately ask: why weren't those systems migrated to SQL2008 long ago? with another organisation which brought along those SQL2000 systems, as a nasty surprise. Or, because of "island automation" where some department first did not fall under DBA/admin support, but now they suddenly do. Etc.. etc..
Whatever the reason, some folks still have DTS packages which must go to (for example SQL2008). 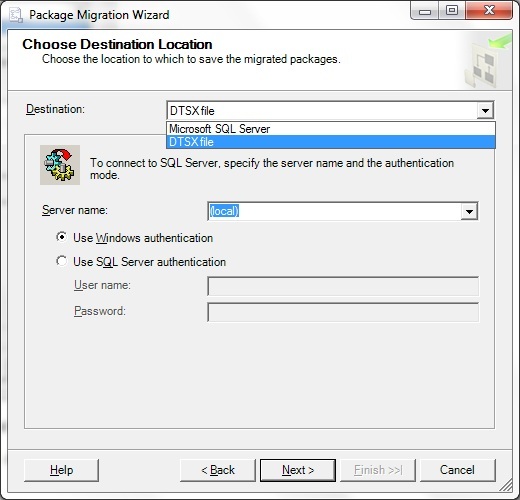 Upgrade SQL 2000 (DTS included) to (preferably) SQL Server 2008 R2 (or higher), then use the "DTS package Migration Wizard". 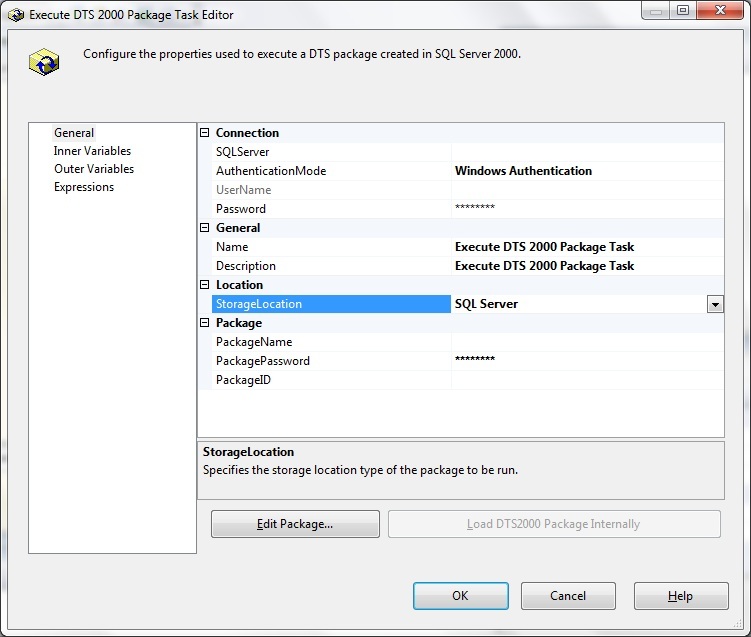 On SQL 2005/2008, and if you have the DTS packages too, then use the "DTS package Migration Wizard". Run 2000 DTS packages from SSIS/SQL Server 2008 R2 (or higher) using the "DTS Runtime engine"
⇒ The "DTS package Migration Wizard" migrates DTS packages to SSIS packages. 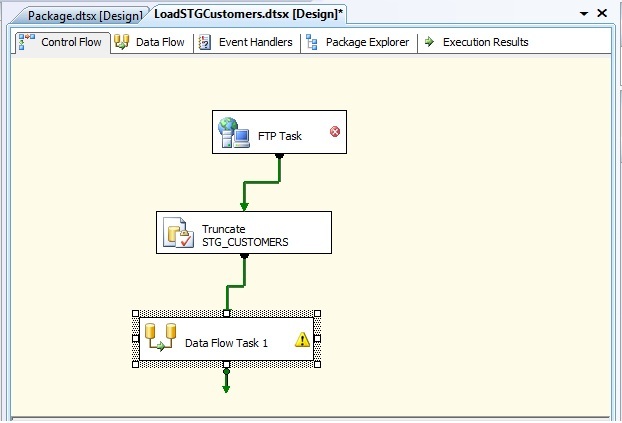 ⇒ The "DTS Runtime engine" makes it possible to run the older DTS packages from SSIS. However, with a SQL Server 2000 upgrade , we should not be surprised if SQL Server 2000 then even runs on a Win2000 System too. The original owner never cared to upgrade. If so, in such a mindset, then it's a real possibility that "everything else" is quite "messy" too (like old hardware ready to "implode", ill designed databases, all sorts of weird dependencies etc..). The DTS packages are so specific and/or complex, that an upgrade simply was not feasable, or too much of an effort. Anyway, both scenario's are quite unpleasant, if the DTS packages are still significant for the organisation. 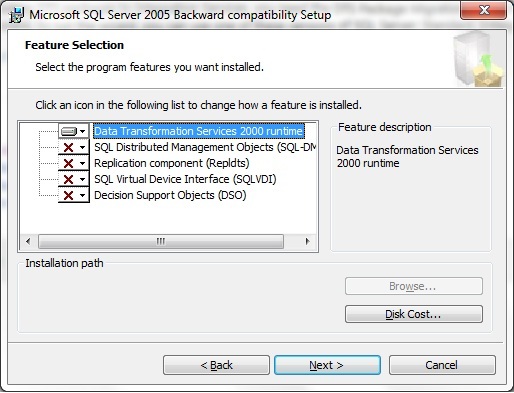 In a nutshell: You can upgrade a SQL 2000 system directly to SQL 2008 R2. The upgrade does not install run-time support for DTS packages, but it does install the "DTS Package Migration Wizard"
which can assist you to migrate DTS packages to the native SSIS format. might be high, but for complicated packages (or packages using some ActiveX scripts, or using features like .udl etc..), you might be dissapointed. does a better job in migrating complex DTS packages. It's not a free suite, but a demo version is available. See also link 5 below. the DTS 2000 packages might act upon, you still might benefit from the "DTS package Migration Wizard". 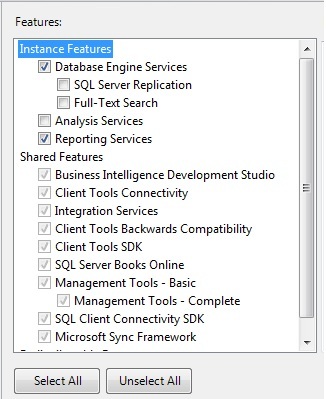 You should have the Wizard on your system, if you installed SQL Server with SSIS and a "shared feature" called "Client tools Backward Compatibility"
But you still need the "DTS runtime engine" in order to use the Migration Wizard, so that might be a bit confusing. So, you do not have another option (to my knowledge) than to download and install the runtime first. See link 6 above, on how to obtain the runtime for SQL 2005/2008. SQL Server 2005/2008 (or later) with SSIS and the "Client tools Backward Compatibility" shared feature. The "DTS runtime engine", which is installed seperately. To download it for SQL2005/2008: see link 6 above. If it's not found, then try to look for it in a path like for example "C:\Program Files (x86)\Microsoft SQL Server\100\DTS\Binn"
Ofcourse, my example again is the mosts simplest of the simplest, but it should give an idea on how to proceed. Now, suppose we have this DTS 2000 package, the .txt file, and the CONTACTS table in (for example) in a SQL Server 2008 database. In this case, we can try to migrate the DTS package to SSIS. Start the Wizard again. On the "Welcome/starting screen", click "Next". a ".dts" file stored on the filesystem. enables me to browse to the DTS package file (not shown in a figure). if SQL Server 2008 was indeed the target system. Next, the Wizard shows you the DTS package(s) that's about to be migrated (although the original DTS file will be preserved). Next, you must choose a logfile where the Wizard will register the status of the migration. was to be expected due to the simplicity of this example. See link 6 above, on how to obtain the "DTS 2000 Runtime Support" for 2005/2008. On that page, look for the "Microsoft SQL Server 2005 Backward Compatibility Components". Although the installers carry "2005" in their names, the add-on product is for both 2005 and 2008. It's a regular and official Microsoft product. When installed, it's a DTS runtime environment, seperate from SSIS. The setup of the addon is very simple. Best is to only choose the "Data Transformation Services 2000 runtime". See also figure 24. Even on a 64 bit machine, the runtime will only support running DTS packages in 32 bit mode. The usage is very simple. In BIDS, create a new SSIS project. In the left of BIDS, you see the toolbox. Simply select the "Execute DTS 2000 Package Task", and drag it to the Designer area. like for example the "StorageLocation". That is all there is to it. 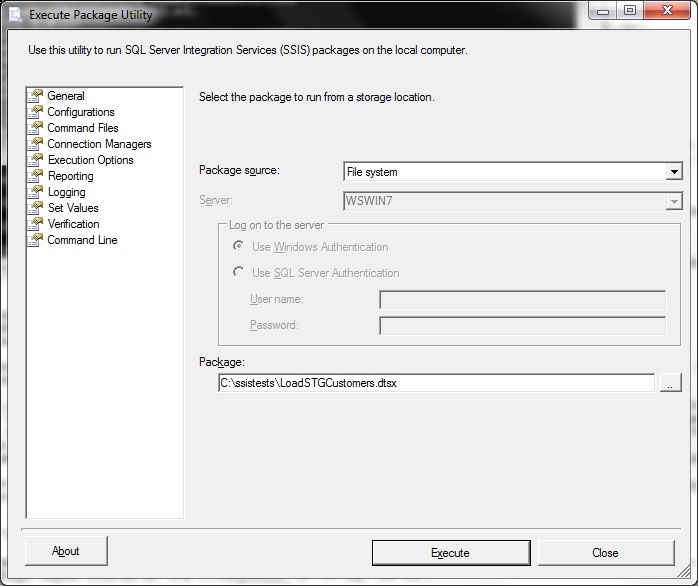 You can save it as an SSIS package now.